Looking for a workforce information system that will delight customers and staff, while improving your agency’s performance? Keep it integrated. Yes, you can meet the needs of job seekers, employers, training providers, workforce staff, and one-stop partners with one system, at one affordable price. A complete web-based solution for workforce development agencies, America's JobLink (AJL) offers advanced features to maximize job center efficiency and improve employment outcomes. AJL’s four seamlessly integrated sections—JobLink, ServiceLink, ProviderLink, and FiscalLink—work together to support customer-focused service delivery; quick, accurate state and federal reporting; comprehensive fiscal management; and so much more. AJL’s self-service labor exchange section, JobLink, provides a powerful state job bank plus intuitive tools and resources that empower job seekers to explore career pathways, reducing the demands on staff in American Job Centers (AJCs). JobLink leverages the O*NET system, the nation's primary source of occupational information, to deliver highly relevant and precise job and resume matches. JobLink is fully integrated with AJL’s case management section, ServiceLink, which determines eligibility for state and federal programs. This integration allows job seekers and employers to move seamlessly from self-service activities to receiving help from their local AJC. User-friendly self-service (Labor Exchange) for job seekers and employers. Free job spidering through Indeed.com and support for the nightly exchange of job Order information with the National Labor Exchange (NLX). Automated job matching with skill gap analysis. Streamlined resume and job order builders featuring responsive design for mobile. Job seeker skills bank supporting identification of transferable skills. Customizable career lattices (career planning maps) showing job progression opportunities within and across different industries or sectors. Support for WorkKeys® and National Career Readiness Certificates. Career information system including real-time labor market information reports, such as high growth occupations, best paying occupations, and labor surplus and shortages. Customizable resource links to aid in career planning, recruitment, or training efforts. Job seeker and employer activity logs for tracking contacts and other job search and recruitment activities. Job sharing via Facebook, Twitter, LinkedIn™, and Google+. Automated notification of job and resume matches by email or text message. Support for more than 60 languages using Google Website Translator. Customizable page- and field-level help text, as well as the ability to upload help videos. Preparing a resume can be an overwhelming task for even the most tech savvy job seeker. The AJL online resume builder makes the process as quick and painless as possible using a step-by-step wizard that minimizes the amount of typing and writing required. Build a resume “from scratch” or upload an existing resume from any computer or mobile device with internet access. Easily “code” your resume for precise job matching with assistance from a type-ahead job title field. This automated occupational coding feature was developed by AJLA–TS and is internal to AJL. Choose from sample objective or summary of qualifications statements based on O*NET job family. Store, edit, and choose from multiple contact information entries in your address book. Add work experience, education entries, additional skills, military experience, awards, licenses and credentials, and driver’s license information (including searchable commercial restrictions and endorsements), and decide which information to display on each resume. Information must be entered only once and can be reused for additional resumes without duplicate data entry. Develop detailed work or education experience summaries using sample, editable work activities, talents, and tools and technologies statements based on O*NET job family. See your progress at a glance at any time by clicking Preview My Resume. View automated suggestions for improving your resume on the Resume Review page. These suggestions are customizable by state. Modify, spell-check, preview, print, and save your resume as PDF or Word in an employer-approved pre-formatted resume layout. Opt into (or out of) automatic job matches by email or text message for each individual resume. An effective job posting is all about attracting and matching to the right job candidates. AJL’s online job order builder is calibrated to the AJL resume builder to provide targeted resume matches on a wide variety of criteria. Like the resume builder, the job order builder guides employers through a streamlined, step-by-step process that results in a detailed job posting with minimal data entry. Build your job posting “from scratch” or clone and edit an existing job posting from any computer or mobile device with internet access. Easily “code” your job posting for precise resume matching with assistance from a type-ahead job title field. This automated occupational coding feature was developed by AJLA–TS and is internal to AJL. Type or upload the job description using the native document uploader. Keywords are extracted for job matching. Access wage information and information on license and credentials relevant to the job order occupation via links to careeronestop.org. Store, edit, and choose from multiple job location and contact information entries in your address book. Select preferred and essential O*NET talents, tools and technologies, and work activities displayed based on the O*NET job family to match against those on job seekers’ resumes. Select the job disclosure level: public, limited, or private. Manage your own recruitment efforts or request staff assistance for each individual job posting. Opt into (or out of) automatic resume matches by email or text message for each individual job posting. AJLA’s partnership with Indeed.com provides subscribing states with access to millions of high-quality jobs across the nation and the world. Indeed.com jobs display the basic job posting information with a link directing the job seeker back to the original source. AJL also supports the nightly exchange of job posting information with the National Labor Exchange (NLX), which can quadruple the amount of job content available to job seekers. All job postings received from the NLX automatically generate a return receipt to support full tracking for the Office of Federal Contract Compliance Programs (OFCCP). Job postings, both staff-assisted and self-service, may be sent to NLX with a single click during job posting creation. An automated interface process continuously synchronizes the status of jobs sent to NLX with changes of status in AJL. These partnerships help make AJL a true one-stop resource for quality job opportunities and are included in AJL subscription at no additional cost. 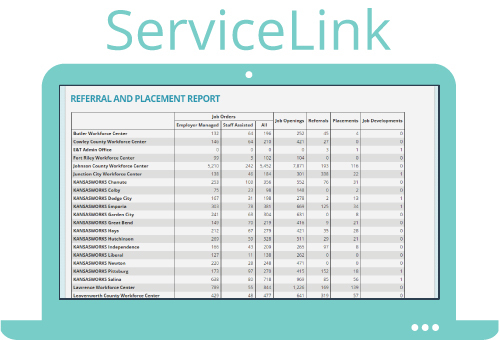 AJL’s case management section, ServiceLink, is a user-friendly, web-based system that supports the delivery of customer-focused job seeker and employer services, and provides a standardized business process for following participants through the workforce system network. ServiceLink was designed for USDOL/ETA grants, but has been customized to manage numerous other federal, state, and local employment and training grants. ServiceLink provides one-stop service tracking, case management, data collection, and reporting. It manages eligibility and maintains program registration and enrollment records. It allows case managers to track client self-services and allows partner programs to access clients’ universal information. American Job Center (AJC) services and case management across programs. Hierarchical, inheritable security structure supporting multi-partner services and case management. Extensive, permissions-based system administration functions. Full support for new state and federal programs and grants. Full set of programmatic edit checks to ensure data consistency and integrity. Universal information client record with document uploader. Customer-focused job seeker and employer services. Customer outreach, notification, and mass communication methods including text messaging. Participant tracking and reporting across different funding streams, from registration to job placement. Tracking of all internal and external job order views and referrals. Online interactive performance and management information reports including ad hoc reports. Events manager for posting information on job fairs, workshops, and other public events. Management functions for office supervisors and region and state directors. Work Innovation and Opportunity Act (Adult; Dislocated Worker; Youth; NDWGs; Statewide Adult, Statewide Dislocated Worker, and Statewide Youth programs; Incumbent Worker; Rapid Response; Rapid Response Additional Assistance). Veterans Employment and Training Services. Trade Adjustment Assistance (TAA, R/ATAA, TRA, TAACCCT). Health Profession Opportunity Grants (Department of Health and Human Services [HHS]). Got a state-specific grant or program? No problem. Full support for the addition of other state and federal programs/grants is included in the subscription cost. New program types and enrollment types can be added within minutes. For example, one subscriber received a new national emergency grant on a Monday and the new enrollment was available in AJL for adding participants and tracking services and expenditures by noon, without programmer or database developer intervention. ServiceLink supports the management of businesses processes, security levels, and reporting by program, while still allowing for cross-program data sharing. A State Administrator sets the permissions and privileges for each user including the ability to determine the level of data control for create, write, and read access for each program (WIA, TAA, LE, etc. ); the ability to restrict access to certain pages in the application (such as wage records); and the ability to control read and write access to similar programs across different user groups. Administrators can also grant offices, agencies, Workforce Investment Boards (WIBs), or regions block, read, or write privileges to program registrations based on their specific program responsibilities. ServiceLink is ready and able to support the alignment of technology and data systems across one-stop partner programs as required under WIOA. Several different levels of partner agency collaboration (for example, with Adult Education and Vocational Rehabilitation) can be achieved using ServiceLink, from read-only access to full common intake and data collection for partner programs including eligibility determination and program enrollments, case management and service information, and joint performance accountability measurement and reporting processes. All program reporting requirements can be met using AJL. AJL includes an extensive menu of online reports available to staff according to the ServiceLink security hierarchy. Online access to reports allows case managers, supervisors, and state and local administrators to continually assess progress toward performance goals, and take steps toward improving performance as appropriate. Federal performance reports are frozen after submission but remain available on the reporting menu for reference. Most cells on the reports have clickable numbers, representing the data (specific participants) that make up the number. Users can drill down from the report to the specific client record. Clicking to view a list of clients in the denominator shows a client report with a column indicating whether the client is included in the numerator. Report functionality in ServiceLink is real-time, with the exception of scheduled import processes as defined by the subscriber. Reports can be viewed online in HTML or saved as Excel files. 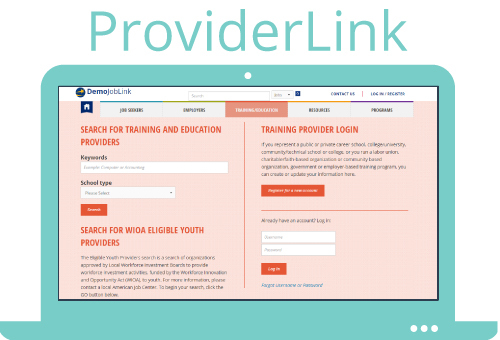 ProviderLink is AJL’s self-service provider section, allowing training providers and providers of youth services to create self-service accounts to apply for inclusion on the statewide WIOA Eligible Training Provider (ETP) List and the list of approved youth service providers. Provider and program records may also be added by State Eligible Training Provider (ETP) Administrators and/or Local Area ETP Coordinators. Searchable statewide list including non-WIOA approved training providers, WIOA approved providers, and youth providers. User-friendly self-service training provider registration. Ability for training providers to add and manage their own programs and enter performance data. Local area and state review processes for initial and subsequent eligibility. ProviderLink includes a standard, customizable workflow for approving provider and program applications. Each local area and the state have their own Eligible Training Provider (ETP) Coordinator login to view, add, edit, and make determinations on training provider programs submitted for approval and inclusion on the statewide eligible training provider list. After a new provider is approved, it is assigned to a local area queue for program approval based on a mapping of the ZIP code to office to local area. Eligibility expires one year from the approval date. However, the system is flexible to allow for any timeline dictated by state policy. ProviderLink is fully integrated with JobLink and ServiceLink allowing case managers, job seekers, and employers to identify training providers and programs that meet their needs. Case managers can easily locate WIOA eligible training providers and WIOA approved youth service providers, as well as populate provider information without data entry; for example, when adding client services. Job seekers and employers can search for service and training providers, as well as view provider information including program offerings and provider Consumer Report Cards. Job seekers and case managers can also use the service provider search to find providers of support services. AJL’s fully integrated fiscal management section, FiscalLink, works in concert with JobLink and ServiceLink to provide a real-time seamless fiscal system for one-stop case management. Participant and vendor financial management. Local area administrative costs management. Participant and vendor accruals and payments. Full suite of fiscal reports. FiscalLink tracks all client payments by funding source and service. Services are tied to the program enrollment in which they were provided. If a client has multiple program registrations or multiple enrollments, each enrollment displays only the services provided by that enrollment. Staff can view a complete list of payments—per participant, per enrollment, and per service—plus a complete participant budget that includes the total budget, amounts expended, and any remaining obligations. Funds are obligated by program year and line item category, and display total budget, expenditures, and obligations by category and program year. Entries are also available for individual training accounts (ITAs) and the tracking of multiple grants. Funding obligations and expenditures can be tracked by office, local area, and statewide. Approved staff can create payment vouchers for service vendors and create and manage service provider contracts including managing expenditure categories. The Allocation Management feature in FiscalLink allows State Directors or other approved staff to manage their State, Region, Local Area and Office Allocations. Approved staff can add and edit obligation amounts, and set and change triggers for warning and blocking the total amounts obligated for a funding stream. Edit checks control the availability and expenditure of funds by PY/FY based on program regulations and client eligibility. 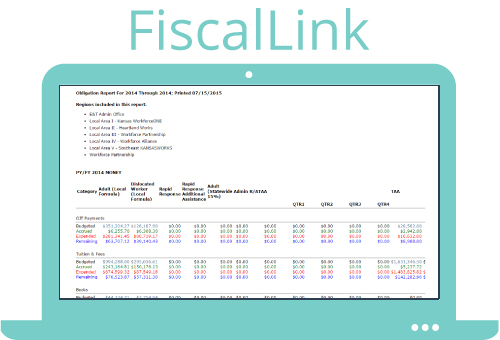 FiscalLink has its own reporting menu providing all needed fiscal reports. Reports are viewable in HTML and downloadable in Excel. The Obligations Report allows fiscal administrators to view all of the obligations, expenditures, and accruals within the desired report area by funding stream. The user can drill-down to view obligations and expenditures. The drill-down report provides a link to each participant’s Case Details. AJLA–TS is committed to ensuring a seamless WIA to WIOA transition for AJL subscribers. We have implemented all current data collection and reporting requirements to support the final WIOA reporting specifications for all core programs, as well as all ETA-specific data collection requirements. Your agency is unique. Your workforce system should be, too. Although AJL is an off-the-shelf product, its flexible design supports extensive customization, allowing each subscriber to maintain or enhance their organizational brand. We know government websites have special requirements and we take them very seriously. AJL is fully compliant with Americans with Disabilities Act (ADA), Veterans’ Priority of Service, and all state and federal security standards including the Federal Information Security Management Act (FISMA). If there’s any constant in workforce development, it’s change. AJL is kept up-to-date with all federal and state mandates. This service is included in the annual subscription fee. Think government systems can’t be cool? Think again. We’re constantly creating new AJL features with that “wow” factor that will impress your stakeholders and keep your customers coming back. Subscription to AJLA–TS products includes AJLA membership at no additional charge. Members have a voice in the ongoing development of AJLA–TS systems, and also enjoy an instant, nationwide network of peers for sharing workforce development strategies and best practices.